“Tomorrow, when your child asks you, ‘What is this?’’ you will answer, “because of what God did when he took us out of Egypt.” These biblical verses are invoked at the Passover Seder, where children are encouraged to question, adults to respond and discuss; an event where family, friends, and strangers gather together to bless wine and break matzo; and religious ritual and symbolic food and drink meld to create a foundational whole. The quotations invoke the Jewish past, present, and future, and the history and destiny of the Jewish people. Curiosity drew Moses to the burning bush and subsequently to belief and knowledge. Transmission and exchange of enthusiastic inquiry, information, and tradition from generation to generation, parent to child, teacher to student, is part of the educational process, and contributes to the continuity of humanity and the world at large. 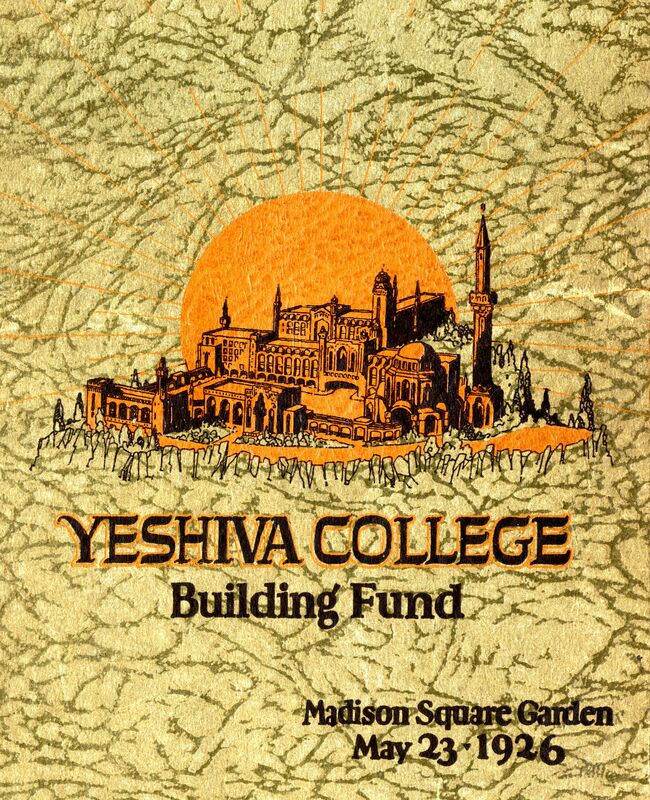 Yeshiva University proudly participates in this endeavor in Jewish and secular realms. You are welcome to visit the exhibit, “Dining for the Divine,” on the fourth floor of Mendel Gottesman Library in person, or you may read the text of the exhibit here. 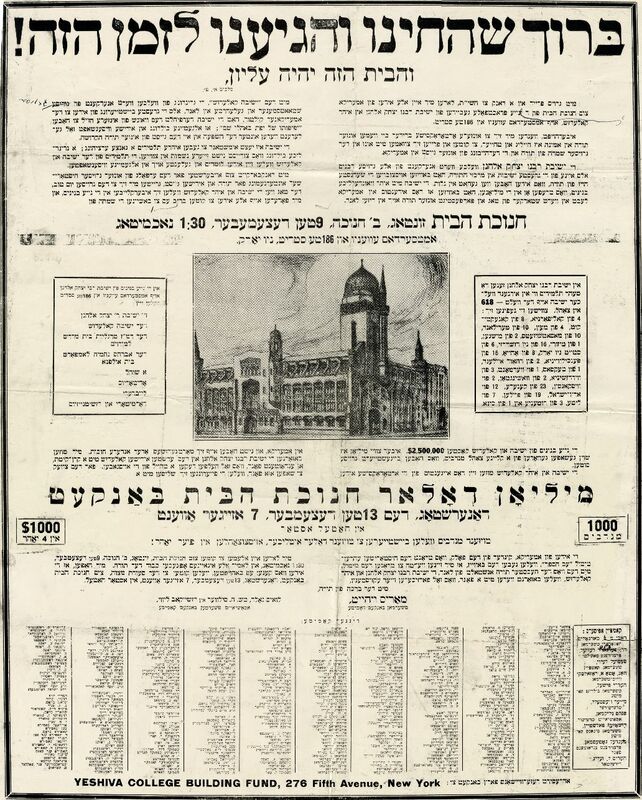 Large Hebrew letters boldly crowned Yeshiva’s advertisement in the New York Times on November 8, 1928, an early instance of Hebrew characters gracing that venerable publication: “זה היום עשה ד’ נגילה ונשמחה בו” “This is the day that the Lord hath made: let us be glad and rejoice thereon” (Psalms 118:24). “And this House shall be elevated” (Kings I, 9:8). The inauguration of the magnificent new edifice marked the move uptown from the impoverished, overcrowded immigrant neighborhood of the Lower East Side to the then bucolic Washington Heights area. It also launched a new era in the life of the institution – the addition of a college of liberal arts and sciences to the Yeshiva. The ornate Moorish Revival structure on Amsterdam Avenue, completed in 1928, can be viewed whimsically as Yeshiva’s bar-mitzva present to itself. 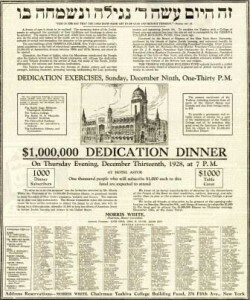 Thirteen years earlier, the 1915 Chanuka dinner had celebrated a different milestone in the growth of the institution, the dedication of a new home in a small refurbished building on Montgomery Street. 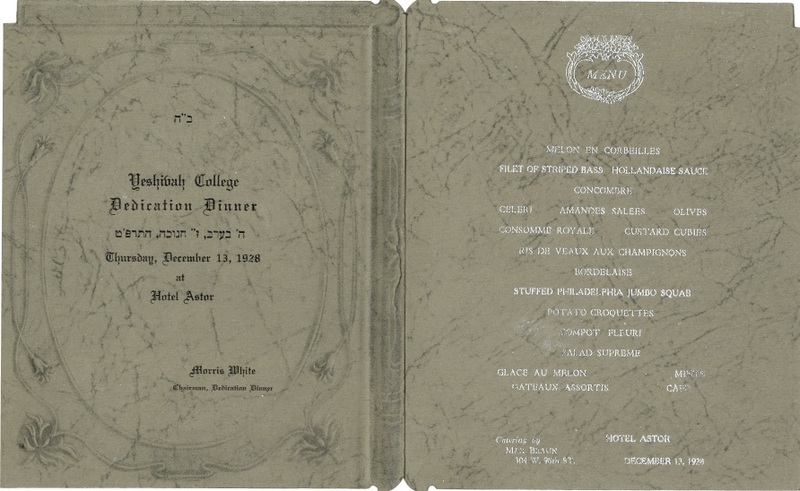 The 1915 event is Yeshiva’s earliest Chanuka dinner on record. 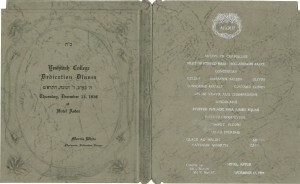 It inaugurated the long-planned union of two pioneering American Jewish institutions, Yeshiva Etz Chaim (founded in 1886) and the Rabbi Isaac Elchanan Theological Seminary (founded in 1897). The dedication also served as the installation of Rabbi Dr. Bernard Revel as Rosh Yeshiva and President of the institution. In addition, the dinner heralded the establishment of the Talmudical Academy high school, a novel educational concept which offered traditional Jewish studies in conjunction with a New York State Regents general studies curriculum. The building on Montgomery Street and the Chanuka dinner in honor of its opening were modest. One observer commented on the “long rough tables … unwieldy plates and rusty flatware” at the 1915 dinner. Typical fare at Yeshiva “simchas” at the time consisted of herring and schnapps. By Chanuka of 1928, both the menu and venue had changed dramatically. The kosher catering at the elegant Hotel Astor in midtown Manhattan was lavish. Even the handsome menu, elegantly printed in the shape of a book, testified to Yeshiva’s new status. The theme of the Chanuka dinner of 1928 was, in the words of the dinner chairman, Morris White, “to dine for a divine purpose” – to transform the mundane into the sacred. So, too, the Yeshiva College building utilized ordinary brick and mortar to honor and glorify Torah. 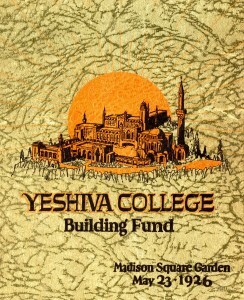 The new building, and the proposed campus, would fulfill Yeshiva’s dual mission. The school, in the words of the Yiddish ad, would be both “the most beautiful home for Torah ever seen in exile,” a yeshiva on par with Eastern European yeshivas, and a college with “general studies … under the influence and in the spirit of our holy Torah.” Thus, from the very inception of the project, the planners were determined to create a distinctive edifice whose unique design would embody its divine function. 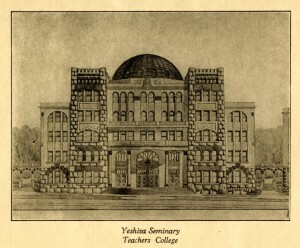 When the Building Committee initially began planning the campus in 1924, Harry Fischel proclaimed that Yeshiva needed a “Betsalel,” a reference to the master builder of the Mishkan, the Tabernacle, in the Bible. “Betsalel” first appeared in the form of Joshua [O.G.] Tabatchnik, “a young architect who lately landed from Palestine.” Tabatchnik had studied architecture in Odessa, and with Boris Schatz at the Bezalel School in Jerusalem. He designed Bet Ha-Dekel (the Palm Tree house), a Tel-Aviv landmark, and the palatial Diskin Orphan Home in Jerusalem, among other projects. Tabatchnik, whose plan for the campus was unveiled at the 1924 Chanuka dinner, arrived in New York to introduce, according to the New York Times, innovations in structural engineering and “a new style of typically Hebraic architecture.” Fischel worked with Tabatchnik on the proposed new buildings. Renderings of Tabatchnik’s plan, which never came to fruition, are housed in the Yeshiva University Archives. 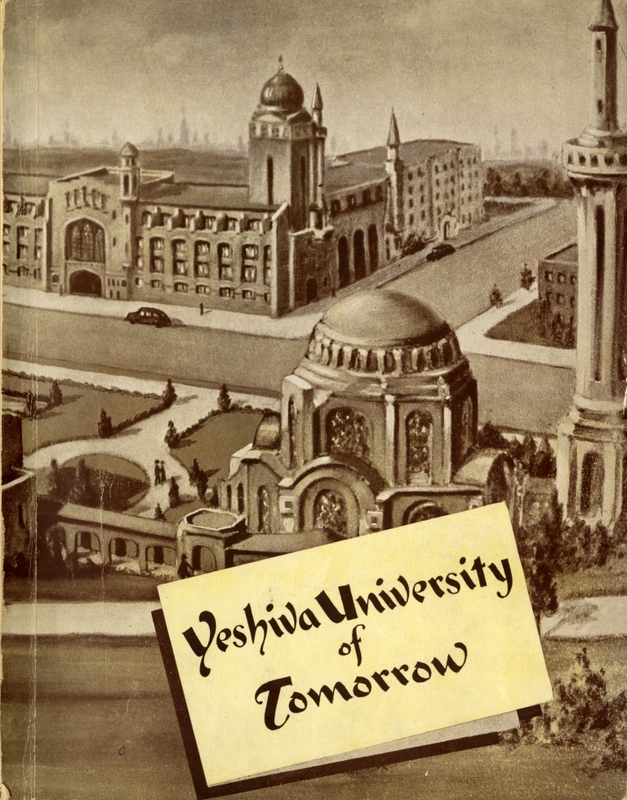 The promotional literature for Tabatchnik’s design discusses influences ranging from Solomon’s Temple to the early 1920s plans for the Hebrew University campus on Mt. Scopus in Jerusalem by Patrick Geddes and Frank Mears. 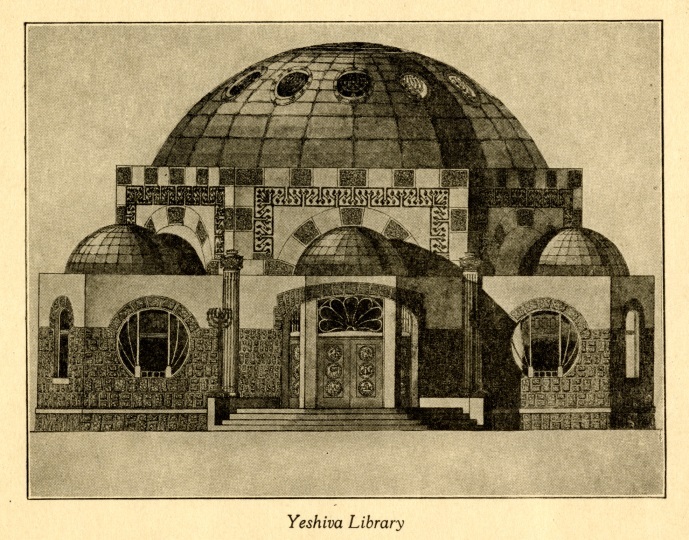 Tabatchnik’s plan was on the table only briefly, when, for unknown reasons, the Building Committee commissioned new plans from the architects Charles B. Meyers and Henry B. Herts. Both Meyers and Herts had previously designed synagogues. 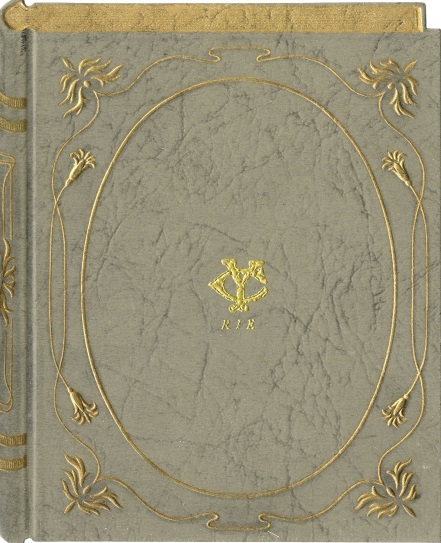 Herts in particular was known as “a specialist in Jewish architecture.” Their designs for the buildings and grounds were published in a souvenir journal and presented to Yeshiva donors at the premiere of “Dedication of the Temple,” the third act of the opera King Solomon by P.J. Engels. This performance, which featured Cantor Yossele Rosenblatt, was part of the “Million Dollar Music Festival,” a gala event held at Madison Square Garden in May 1926. The sketches of the plan depict an exotic campus straddling Amsterdam Avenue. On the east side, the campus stretched from 186th to 188th streets and to Laurel Hill Terrace. The architectural drawings show a familiar building on the west side of Amsterdam Avenue, between 186th and 187th streets. 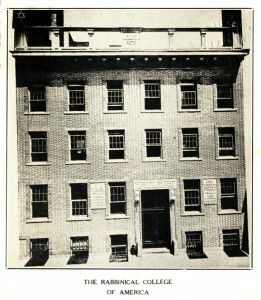 This building, whose dedication was celebrated at the Chanuka dinner of 1928, is now Zysman Hall. 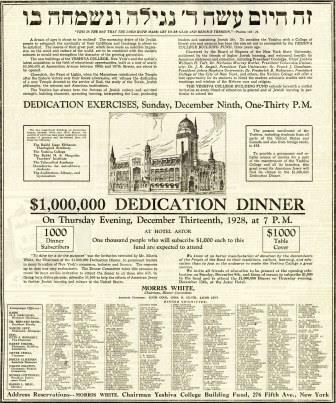 A mere ten months before the stock market crash of 1929, the guests and donors at the 1928 Chanuka Dedication Dinner sat in the splendid Astor Hotel ballroom, enjoyed the fine cuisine, and listened to the optimistic orations. Surrounded by exquisite décor, they could not have been expected to imagine the economic catastrophe that would temporarily derail the planned growth of the rest of the campus and doom the magnificent plan created by Meyers and Herts. 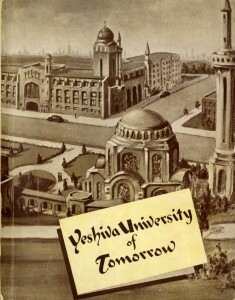 In the early years of the Great Depression that followed the 1929 crash, Yeshiva’s leaders continued to hope that they would be able to complete the proposed campus. As the thirties progressed, the nation became more deeply mired in the depression. Donations dropped precipitously. Yeshiva nearly lost the new building to its creditors and was forced to sell the land on the east side of Amsterdam Avenue. Despite the depression, both the prestige of the school and the size of the student body grew. 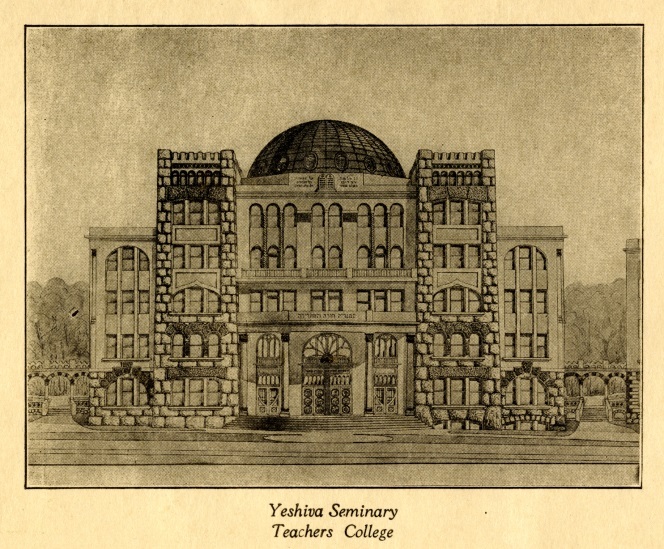 For many years the 1928 building, ultimately intended for the high school, followed in the footsteps of the tale of the Temple in Jerusalem, which miraculously expanded to include all who came; the lone building served all of Yeshiva’s needs. 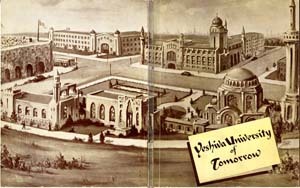 A vision of “Yeshiva University of Tomorrow,” a future campus based on the Meyers-Herts plan, appeared on the cover of a December 1945 dinner journal. 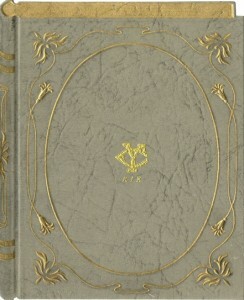 This variation on a theme is the final known use of the motif. Eventually new buildings were added, although none were built in the Orientalist style of the original plan. The Washington Heights campus, now the Wilf Campus, is an eclectic mix of architectural styles. The Glueck Center, completed in 2009, is the most recent addition. The campus, and the school itself, have evolved in ways its founders could scarcely have imagined.